Wee Wee, It’s Me, Gracie – Introducing My Big Sis, A#1 Abby! Hello all, remember me? I’m Gracie and I live at Sasha Shangri-La with my Mummy and Daddy and brothers and sisters too! Mummy is downstairs and really busy now. The postman came to the door and rang the bell. So Mommy was off in a flash and she was very excited too! I wonder what is happening?? So much is going on here today that Mummy left her blog wide open and I know she will not mind if I post a photo or two. Don’t you agree? I really, really want you to meet, and I cannot wait on Mummy, my biggest sister, Abigail Lynn. She is Abby to me and I love her so much! Abby loves to hold me and she reads stories to me all the time. Mummy reads to me too. She read to me that Abby was probably made from a kit. 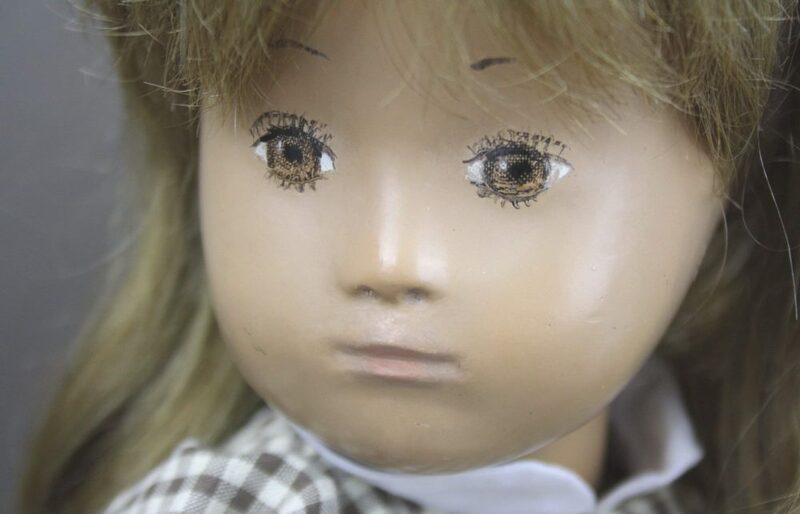 This means Abby’s head, wig, and face painting were done by Sasha, and the rest of Abby was made by a person using patterns and materials supplied in the kit. Don’t you think it is wonderful that Sasha looked for so manys ways to put her dolls into the arms of children? 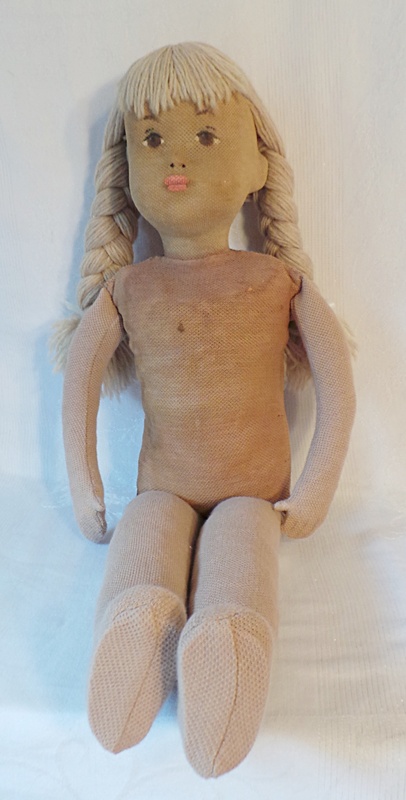 Abby’s wool yarn wig and the cork shavings in her arms and legs helped to identify that she is from Sasha’s early years in dollmaking. 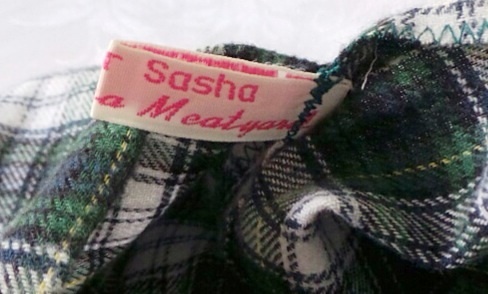 A Sasha label is nice to see! Mummy is talking to someone downstairs and she sounds so happy! :). I love her so very much and she always has hugs and kisses just for me, Gracie. :). So, while Mummy is still away, Abby and I are going to play dress-up. 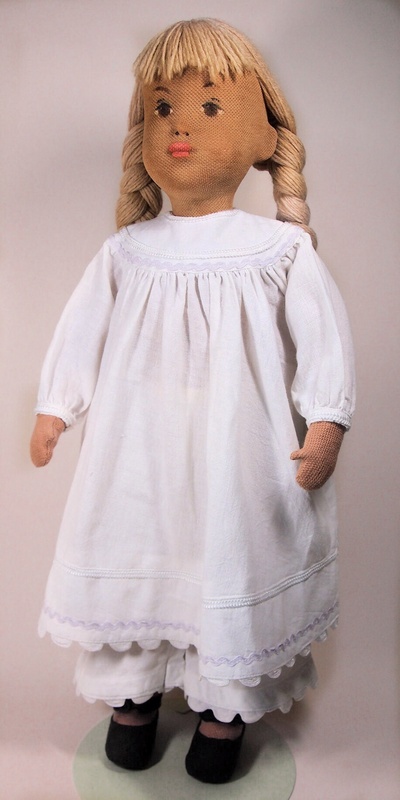 Abby has a new dress to try on that Mummy found on Shelly’s site and I do too. Are you ready? Off with my red shoes and here we go! 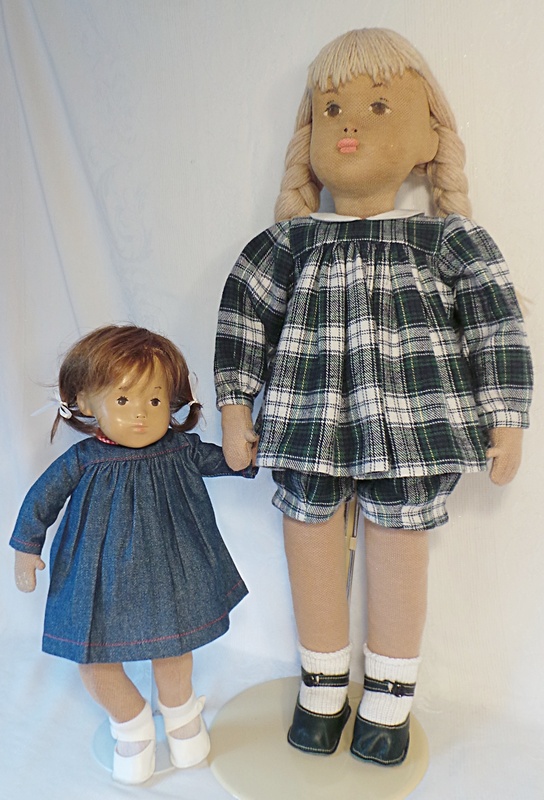 This flannel outfit was made by Christina Meatyard and Abby’s shoes and socks are by Ruth’s dolls. I think this outfit fits Abby perfectly. Do you see the little tuft of hair on Abby’s neck? I tug on it often when I give her my big Gracie hugs! Another tag that is nice to see! Look, I am taller than Abby in this photo! Well…..
Abby up close. I love her beautiful, brown eyes. I think I hear Mummy coming but one last thing for you before I go. I want to share this photo. I am not certain that Mummy would want you to know about this story but I think it is special and worth telling. Mummy kept this photo as a reminder of an ebay auction she lost years ago and she was very sad to lose out on. 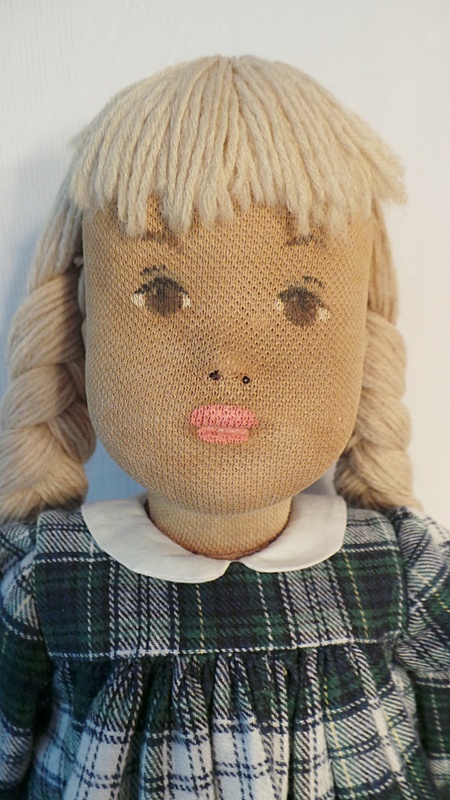 She said she fell in love with the face but did not know that she was a studio doll. 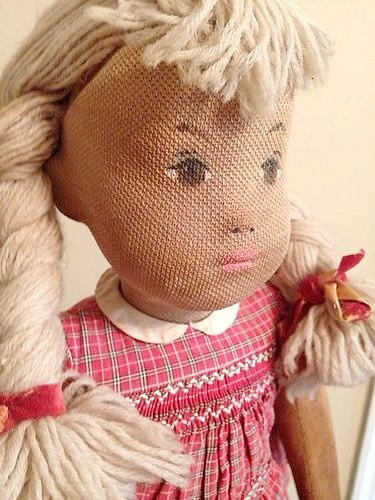 Mummy thought it was a Course Doll with incredible eye painting and an unconventional yarn wig. 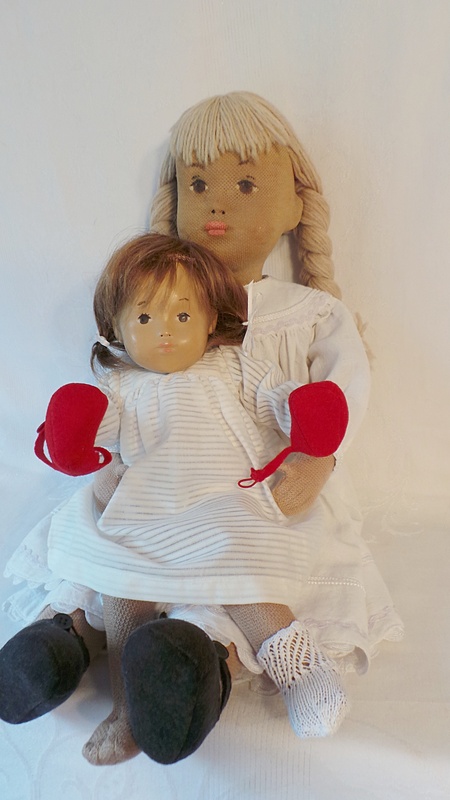 Mummy’s first doll was a much loved Raggedy Ann doll that had yarn hair too and that childhood memory warms Mummy’s heart even now. 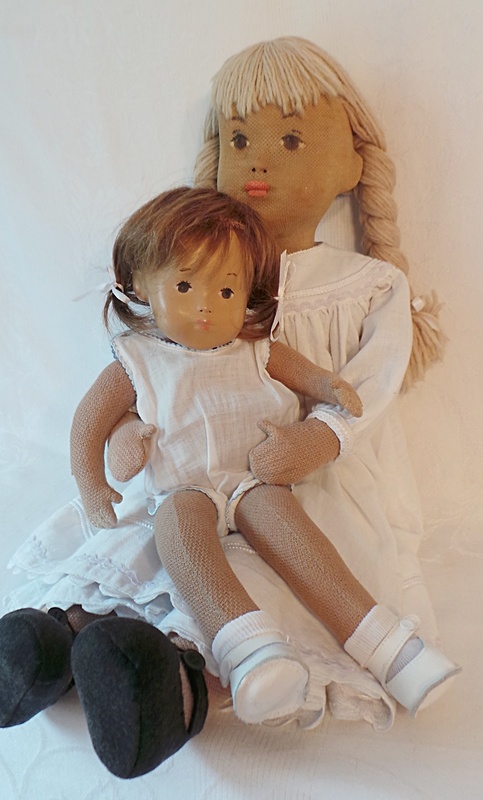 So…..
….years later, Mummy was so surprised and so happy to find this beautiful girl again on Susanna Lewis’ site last year and so lovingly restored too! 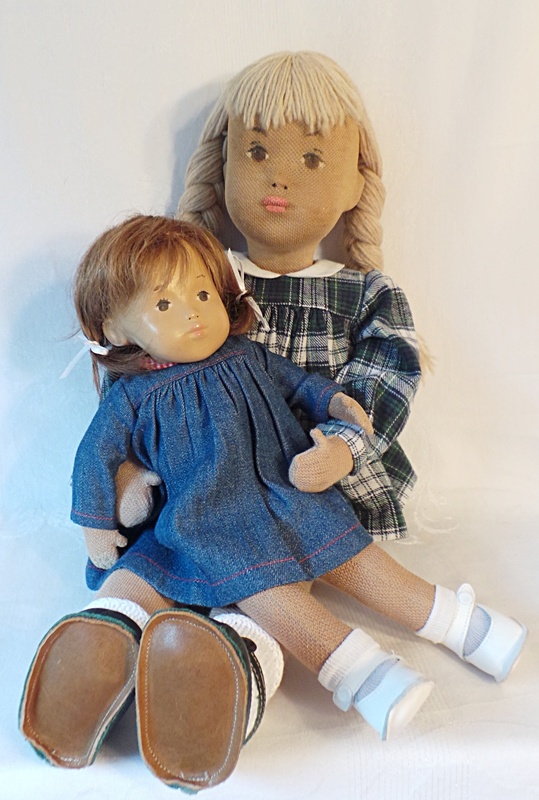 Susanna really helps Mummy to learn more about Sasha dolls and especially more about dear Abby. What a lovely interesting tale you have to tell, Gracie. How nice to have such a special big sister who is happy to give you hugs and tell you stories. You both look so very lovely in your new clothes although I must say that Abby’s white dress set is very special and extra nice on her. 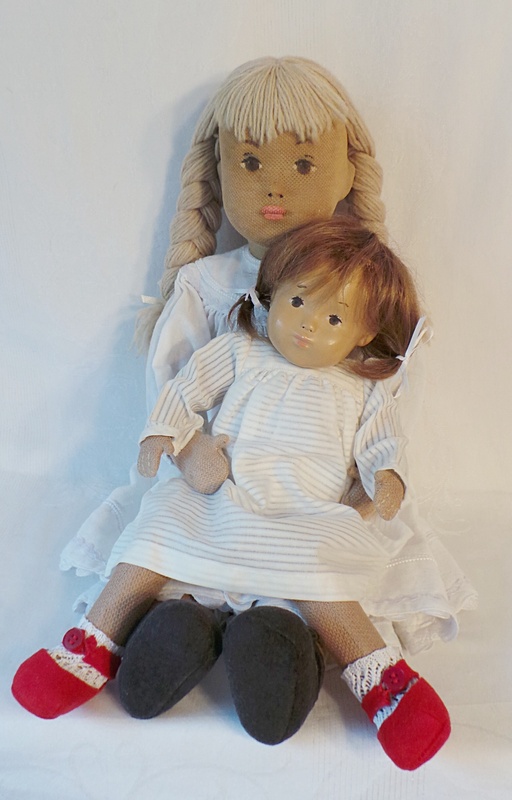 I really must get round to reading more of the Sasha history and finding out more about these early dolls. 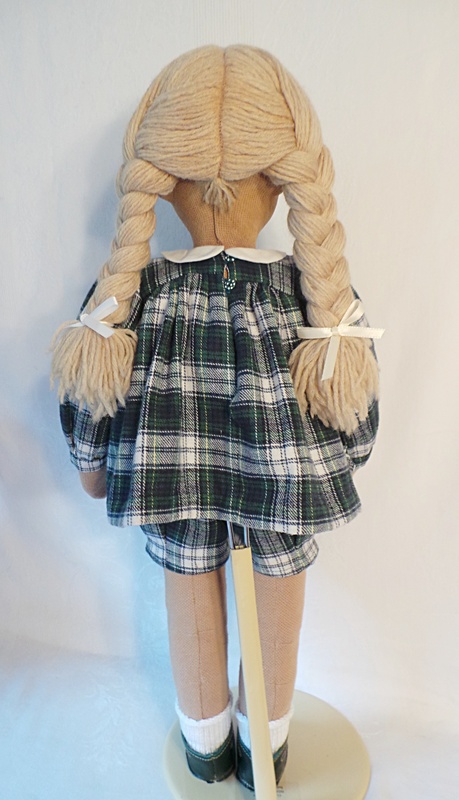 I have been looking at the course dolls and nearly bought one earlier this year but then had to let it pass but now at last we have one that will be arriving at the beginning of next month, so we’ll be able to enjoy one of these lovely doll here. These are two darling sisters. Aren’t you so lucky to have them. 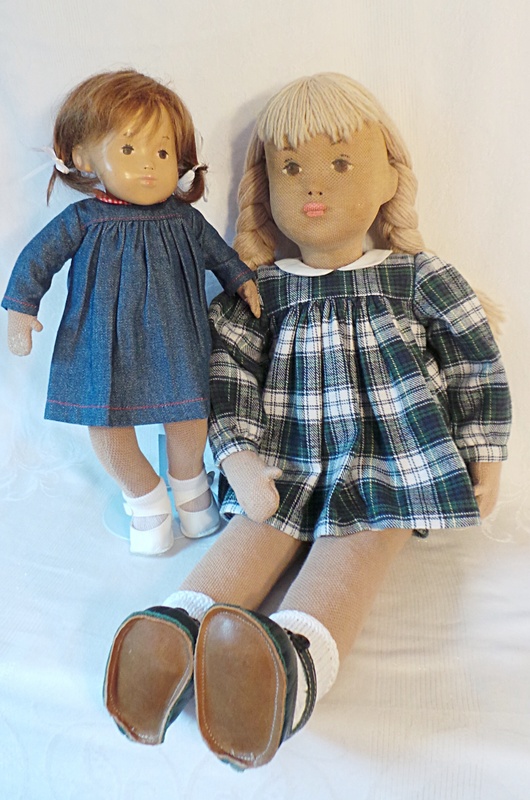 Thank you Ginger…what a lovely story about Abby and Gracie…beautiful dolls and I love their clothes. Hello Little Gracie, what a lovely post you have written about your sister A#1 Abby. It was super interesting to read about her history and the journey she made before she came to live with you. What good luck your Mummy had left her computer and blog open for you to write this. You both look lovely in your new outfits, but your other ones were also very special indeed. Oh wow, what a lot of lovely information you’ve given us Gracie! You have such a wonderful new sister in Abby, no wonder you’re so full of excitement! I think the two of you are going to become inseperable over the years!!!! I’m really pleased to meet her and look forward to seeing more photos of the two of you in the future! How wonderful that you were finally able to buy Abby after all those years of first catching a glimpse of her. Guessing that it could be classed as one of those little Sasha miracles that happen from time to time! 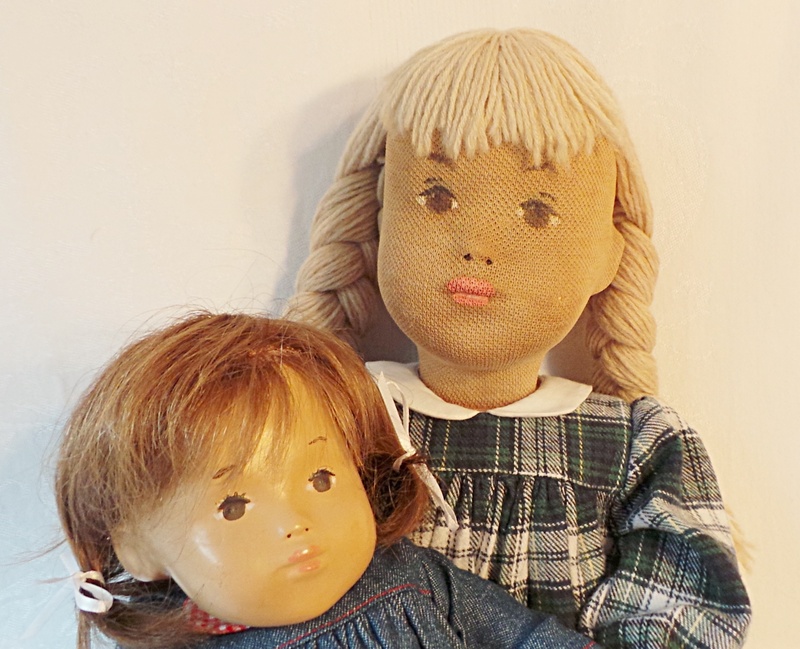 I first met and held one of these dolls at my very first Sasha funday in 2004 and immediately fell in love with her and asking for a first refusal should she ever need to be sold on…..although guessing that there will never be any chance of that happening in my lifetime! I try to learn something new everyday to do with my Sasha collecting hobby so was especially delighted to read this post and all it’s information. Both your’s and your sister Abby’s new outfits are really lovely. You’re both very lucky but well deserving girls. I hope that you and your family have a super weekend. Thank you Kendal and I do agree that Abby is a little Sasha miracle and I love thinking of her in that way! 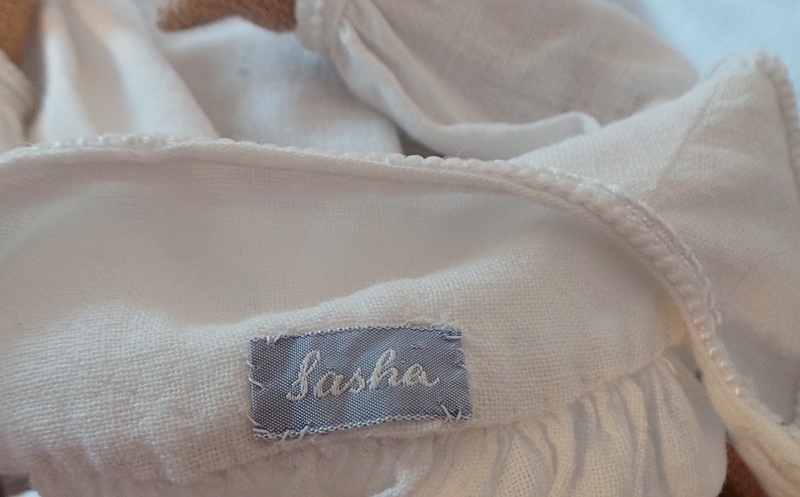 So many caring and talented hands have brought her forward in time, from her Sasha studio beginnings, to where she is today. 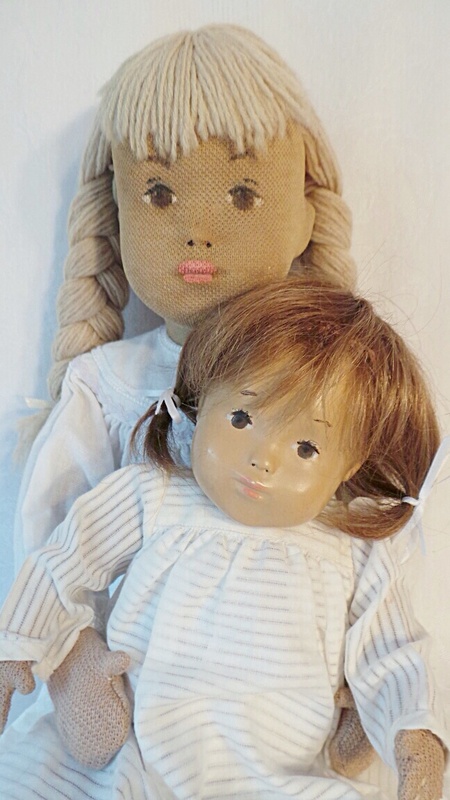 Ginger, this post was fascinating, I had no idea Sasha made heads with the tricot material for kit dolls. I have loved reading all about Abby and her journey to finally be with you! How wonderful that you found her, she has had an incredible journey. What I love most about her is that her face is that of a grown up Gracie! 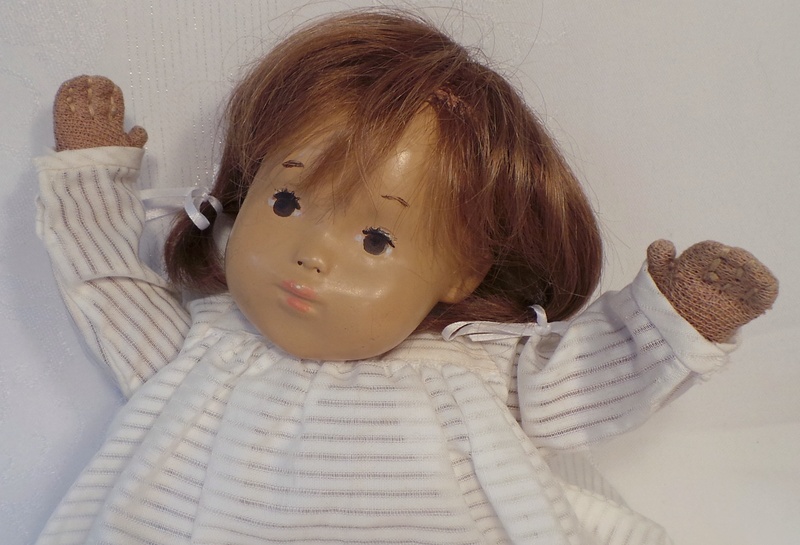 …so this is were that girl lives now, I have seen her on ebay (yes had placed a to small bid) and also later on Susanna’s sales page. 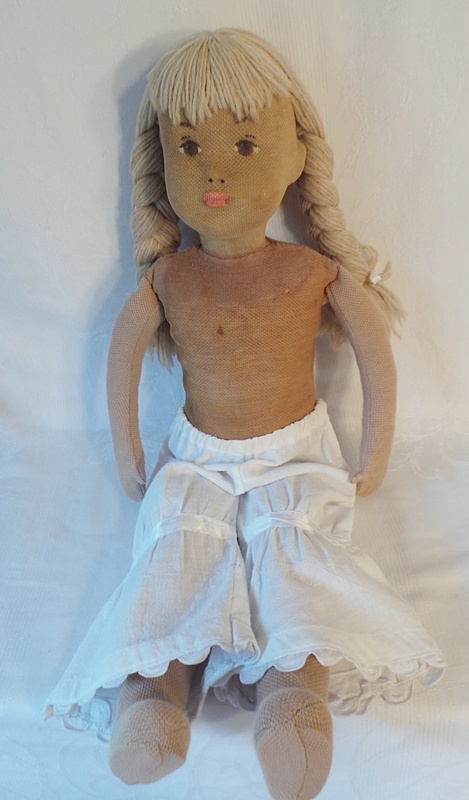 A very early and special doll you have with her. Congratulations Ginger.